There is very little development on the white-sand-beach-strewn Dawei Peninsula. For a start, the Burmese traditionally don't "do" sand and surf, so a beach with waves is pretty much a hot, wasted space between the village and the fishing ground. And tourism hasn't taken off - a function of tortuous government regulations, the fact Myanmar has only recently emerged from 50 years of insulation and nationalisation, and foreigners being very restricted as to where they are allowed to go. The result is that hardly any tourists go to the peninsula, and although a few hotels/beach bungalow developments have been built, or at least started, in various idyllic locations, almost all are stalled or closed awaiting the granting of a licence. Still, our friendly travel agent said there were a couple of places to stay, and booked us into one - a German-Burmese joint venture. We'd find an unspoilt beach, good food, clean cabins, and friendly people, she said. A The 2/3-hour or so journey there by motorbike would take us through interesting villages and that would be a highlight too, she said. There was one caveat - the road was unpaved for the last hour or so, and could be a bit bumpy. But we'd manage fine. Which we did. The villages were interesting. We saw rice being harvested and we got a close-up look at the miles and miles of rubber plantations that still make up a good sector of the Burmese economy. Each tree (and they are little spindly things - not how I imagined at all) has its spiral of cutaway bark, its little spout and a cup underneath to collect the rubber. Dotted through the rows were small wooden two-storey houses on stilts, with thatch or corrugated iron roofs. Each house has a tiny bay window sticking out on one side of the top storey and fitted with coloured glass, like a stained glass window. I can only think they must be for the household shrine inside. Outside the houses were drying lines made of bamboo poles - some for washing, others for fat white sheets that look rather like elongated bath mats - the rubber. Everywhere there was road-building going on. Trucks had delivered big drums of bitumen and piles of stones, gravel and sand and put them along the side of any road destined to be widened or upgraded. Then it seems pretty much a manual process. Women wearing jandals grade the stones on the side of the road and then carry them and the sane in baskets to where they are thrown onto the road. The bitumen is melted in the drums over fires on the side of the road, and a guy with a plastic bucket with holes in the bottom, walks up and down putting a layer of tar between the stones. He wears rubber boots, but no other protection. Road building in Myanmar must be a seriously unpleasant job. The gravel track was, as predicted, a bit hair-raising at times, particularly when it became little more than a rocky hillside, or a slithery sandy pathway. I was immensely relieved that Sam had chosen to ride with Geoff not me. And that he found the whole thing a great adventure. 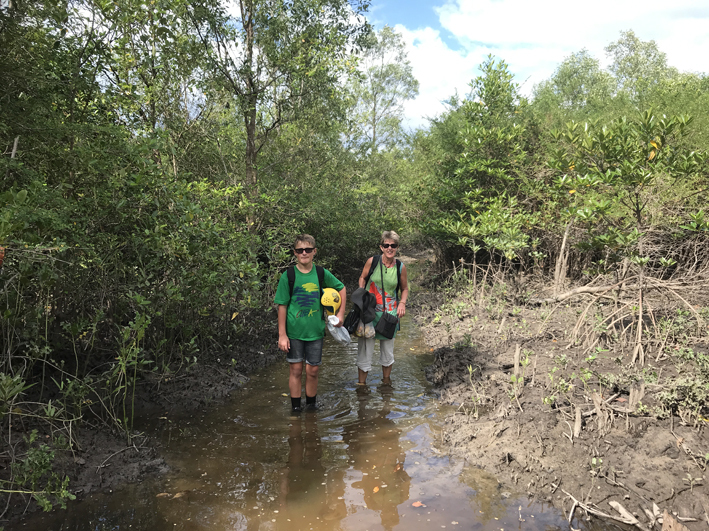 After about an hour on the off-road track we arrived in a village and there were two choices - straight ahead down a forest path, or left down a seriously steep concrete track to a mangrove swamp. A small blue sign pointed left: "To beach". We remembered advice from a couple of men at our lunch spot that there might be a problem getting to the beach at high tide and decided to lock the bikes at the top, shoulder the luggage and proceed on foot. The last 20 minutes wasn't even a track, but a pathway through a mangrove swamp. I kid you not. Water sometimes above the knees and biting insects. It was more Crocodile Dundee than road to the beach. It was really hot and we were already tired from a motorbike ride that had taken the best part of four hours, one hour needing serious concentration. Sam was very unimpressed. But finally the mangroves ended and a line with drying sheets appeared. We had arrived. The beach, as promised, was lovely. A wide expanse of almost-white sand, jungle-clad hills, clear blue sea, some good-looking waves. Safe at last, we thought. We found the guest house's small restaurant and were greeted by a European man. I'll call him Peter. He looked horrified to see us. What were we doing here? Didn't we know the place was closed? They had been trying unsuccessfully for two years to get a licence and were operating illegally. They had been visited by the local police the day before to check they weren't open and the police would certainly be back for a follow-up check, if not that day, certainly the next. They couldn't afford to have any tourists there. Hadn't the travel agent told us? He was extremely sorry, but we couldn't possibly stay. We could have a swim and then we'd have to go back to Dawei. To say that we were upset would be an understatement. Seven hours since we'd arrived at the bike shop/travel agent that morning, the owner wanted us to turn round and do it all again. Just breaking the news to Sam was an impossible task. We sat down and looked very sad. Was there no alternative? The owner was reluctant but fabulous. He made a couple of calls and came back. Yes, we could stay. But we had to be ready to evacuate at any moment if the police came. This wasn't the first time the place had been raided over the last two years, he said, and there was an early warning system in the village beyond the mangroves. Relatives of the Burmese partners would ring if the police were coming and we'd have the time it took for the officers to wade through the swamp to make the place look like there were no guests. To run a business in a country like Burma you'd need vast supplies of optimism, perseverance, courage and humour. He definitely had them. We didn't stop to ask details; we were too grateful. He showed us to our cabin.